Your small business is finally taking off! You’ve worked hard, and now it’s time to start collecting some profits. Along with the celebration, though, comes a moment of panic. You’re shipping more items than you can handle, and the postage costs are going through the roof. Now is the time to consider a courier service as one of your small business solutions. Most small business do not think they need a delivery service outside of the post office. However, courier services today can outperform regular postal delivery in several categories. We will take a look at how a courier service can be better for price, speed, and scale. We’ll also consider how to determine which courier service will be best for you. Typically, larger shipping companies can offer better rates, but this is not always the case. If you are shipping heavier packages or large items, a smaller courier service may be a better option for you than UPS or FedEx. Another consideration is how you price items for your customers. Affordable mailing rates make it possible for online retailers like you to offer free shipping on products. This simplifies the payment process for the buyer. Think about it. If you have the choice between two sellers with a product of equal cost, but one offers free shipping, who are you going to buy from? Courier services are great small business solutions because they offer flexibility in your shipping rates and packaging needs. They can give you a discounted rate for bulk postal purchases, something the post office can’t really do. Also, FedEx and UPS typically require astronomical postage costs before they can offer a discount. A smaller courier service can work with you on a one-to-one basis. Courier services also don’t consider package weight as much as they consider the distance of the shipment. This can mean cost savings on heavy items shipped close to home. Freight pooling is another method in which courier services can save you money. The company combines many large items that are being sent to the same location, which reduces the price for all the packages. I think we can all agree that speed is not the reason most people choose USPS, UPS, or FedEx. They may have some faster options, but they are often not known for delivering on time. Most people pick these carriers for reliability, not for speed. Courier companies are both fast and reliable. These services can pick up and deliver on the same day. They are also available to pick up anytime, day or night, as well as holidays. Tracking systems are also often offered by courier services. This allows both the customer and seller to know where an item is at any given time as well as to plan the pick-up/drop-off in a safe and secure manner. Some courier services even specify fifteen-minute windows of when an item will arrive. If your business is only selling a couple packages a day, your local mail carrier will be fine. However, if you’re starting to ship more and more items daily, you need to consider some better small business solutions, like a courier service. As we’ve already mentioned, courier services can offer you a discount if you are shipping large quantities of items. They can also be useful for large item delivery. Courier companies will also deliver some items that may be too sensitive for the post office. Medications, perishable items, and car parts would be better delivered by a courier than the mailman. 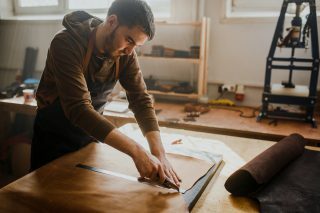 Outsourcing fulfillment is a newer concept in the business world, but it’s at the top of the small business solutions list. Courier services will now store, package, and ship specific items for you as they are ordered, saving you the packaging hassle. You may not think your business is big enough to use outsource fulfillment. Think about the amount of time you are spending on packing and mailing items every day. If your answer is more than an hour, you may want to look into a courier service, which can help you lighten that load. Now that you’ve seen the light about courier services, how do you determine which is the best small business solutions match for you? Initially, you’ll want to ask if the courier service you’re considering is a contract service or an employee-based service. This may seem like splitting hairs, but a contract service means the drivers are paid per delivery, not a salary. This can mean they are in more of a hurry to deliver more packages and will not take as good of care of your shipments. On the other hand, a courier service with salaried drivers can be better trusted. These drivers are less likely to be careless with your deliveries since their job depends on it. Reputable courier service drivers also carry insurance and frequently undergo background checks and performance reviews. This makes sure your deliveries are safe. One benefit of courier services is that there are so many of them, and they often specialize in different delivery options. Your business may want to partner with a few different services for different kinds of deliveries. For example, you could have a different service for expedited, over-night, or low-cost shipments. Some services may be better at handling returns than others as well. You definitely want to consider this when choosing your courier company. Make sure to pay attention to the fine print. Some courier services will give you a discounted rate across the board for your average number of items. Others, however, will only give you a discount based on your daily number of packages. This means that one slow day of only five packages could mean you pay full rate for those items. When considering a courier company, one of the most important issues is speed. You obviously want the fastest shipment for the lowest cost. This can often differ from courier service to courier service. While it’s great to have branded vehicles deliver your items, sometimes this is just not cost effective. Courier services can eliminate the need to have delivery vehicles of your own but still give your customers the look and feel of a professional delivery experience. The business of courier companies is expanding. You can find them almost anywhere in the continental US now, making it easier than ever to find an efficient and reputable service. Interested in taking the first step in finding a courier service? Get a quote! previousAre You Working with a Legit Forwarding Agent?